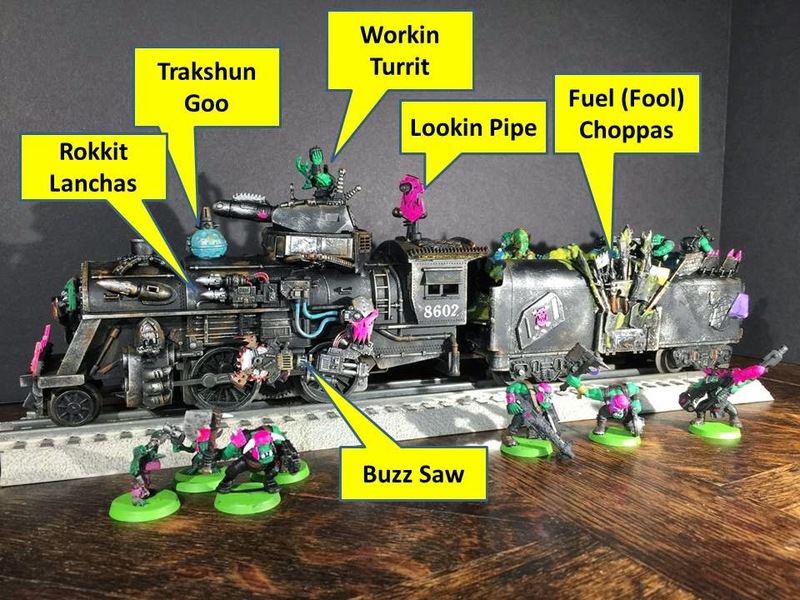 Da Pink Orkys Dakka Chugga! And, plenty of small things left to complete -- those will be fun! Trakshun Goo Holda The Pink Orks' Mek has had his grots scoop up Tyranid icor and has loaded this into a dispenser. Because of this, the Dakka Chugga can plow forward without rails. When it comes to the Don't Touch Dat! rule, this is one of the controls to watch out for!! Lookin Pipe With the load-out of gear, it's difficult for the Dakka Chugga's Driva (engineer) to see. So, he can zero in on his targets using this periscope. Buzz Saw Ground troops should stay away from the port side, else they'll be buzzed up (and prepped for the fuel process). Rokkit Lanchas The Dakka Chugga is designed to throw a serious punch. We plan to run it with the maximum number of rokkit lanchas under the looted wagon rules. Here are front views of the Dakka Chugga. Clearly comes with a built-in reinforced ram. The Kow Kacha is nicely set up to help plow through enemies. Dakka Chugga from the front! Here is a close-up of the Tenda where the side-bin of Choppas is stored - at the ready. After a battle, dead bodies of (Tyranids) can be chopped and chucked directly into the Tenda. Boyz in the Tenda Set-up with some big weapons to ensure there is nobody coming up behind the Dakka Chugga. Fuel (Fool) Loada As you might guess, the Loada is chuckin fuel (Tyranid bodies) into the Boila of the Chugga. Driva The Dakka Chugga's Driva is peering out the starboard side - figurin' how to go fasta and fire more dakka! Combi-Big Shoota-Burna and More Big Shootas Lots of shooty and burny weapons on the starboard side. View of the starboard side of the Dakka Chugga and "Feecha List"
We took photos with the Chugga decoupled from the Tenda. Here's a look at the cabin of the Chugga. We added a skull throttle and other Mek-modified controls. The Pink Orks also had to enlarge the opening of the Boila's Burna-Box to fit Tyranid bodies inside with only some shoving! 2. Building the Dakka Chugga! We built the Dakka Chugga from a classic Lionel steam engine. In this case, a 2-4-0 rig. We had several to select from (had purchased a bunch of old parts off of eBay - plus had been collecting here and there). But, we wanted to pick an 'engine' where we had 2 almost identical shells. The reason for this was that we wanted to make a rusted up version (which the Pink Orks could find) -- and then the Mekked-up Dakka Chugga's 'engine'. Here is the rusty engine we created side-by-side with the finished Dakka Chugga. We started work on the Tenda. Step one was to cut out the coal. Note: That old-school plastic in Lionel models is extremely hard. It's almost like a bakelite material. Makes a real mess. We used a demel tool to do most of this work. The next step was to create a box into which we could glue the Tyranid bodies. The class Lionel tender is a flat metal piece with two trucks attached. The tender body attached on top of that. We didn't want to glue to that metal piece. So, we took the metal base off and worked on the plastic top. We used plastic sheet to form the base - used pretty thick material. We added some straight sprue pieces underneath to act as beams. We needed quite a bit of gluing surface area to get this to hold together with that bakelite type plastic. Then we started adding plastic bits to the outside to make a patched look. We put some into boiling water to warp them to the contour of the Tenda. Some Trukk armor bits in the back. We had gotten our hands on some broken up Tyranids on eBay. We pieced these back together and air brushed them to that the tops would be blue, bottoms black. Then added accent colors. We figured that these were probably not the greatest colors for Tyranids - but they looked nice side-by-side with our Pink Orks. These are the ill-fated Tyranids. We first fixed them (got them on eBay all broken), then pained them, then staged photos for Chapta 2 of our story. Then, as you'll see, we hit them with Choppas! Dakka Chugga's Tenda all primed. Laying in base of larva pieces. We ended up putting the Loada Boy up on top of the pile of bodies a bit more. Helped to make him stand out and also seemed more realistic. We mixed the GW's gooey green Nurgles Rot paint with Grumbacher Gel 531 to make a thicker mix and then dabbed it all over the Tyranid bodies. Then we glued those in place. Tenda full of Tyranid bodies. Still needing more Tyranid icor! Then, it was time to work on the Chugga! Step one for us was to remove the motor from the inside. This really helped because then we were just working on the plastic shell. A really nice person on Dakka Dakka had sold us a whole bunch of bits (many from Trukk, Battlewagon and Stompa) so we had lots of great raw material to work from. A big problem, though was finding a way to place a turret onto the Chugga. We built up a lower section of the turret with various pieces of plastic. And, to make sure this stayed on well. we used exoxy. Super glue connections to the Lionel plastic weren't working very well for us. And, we had a hard time getting model glue to work. So, we went with the heavy-duty epoxy. This worked just fine - and left a bead which looks very much like an Ork Mek weld. We wanted to have missile launchers - but couldn't find any good ones in our bits pile. So, we used some of the shoota weapons from the Ork planes -- cutting off the gun barrel -- and then glued in the tips of missiles. Here's how things looked after about 50% of the work. We still hadn't mounted the weapon "arms" on either side. To put the goo dispenser on - we actually cut the sand-dome off of the top and glued one of the spherical tanks we had left over from our Mek Gun build right into the hole which was left. The big teeth and horned piece on the front game from some (of what we think were) GW Fantasy bits we had picked up on eBay. It took some cutting to get that to fit over the headlight of the Chugga. But, we did get it done finally. Half way done with the shell! To create the Driva we tried to make an Ork who looked a lot like the stereotypical train engineer. Couldn't find a very good engineer's hat though. So, this is actually a hat from the Panzer officer -- cut off carefully -- and then reamed out to make hollow -- and glued onto the Orks head. The arms of the Ork are from the Ork Trakk -- modified a bit to make it look like he's wearing work gloves. And, here's the shell -- nearly completed. Still a few touches to add (the hoses from the slime dome), getting the Driva's head glued on. But, mostly finished. Shell of the Chugga almost done! We actually didn't fully assemble it until we got it to Canada. More of that in the transporting section. But, it does go together pretty easily. We had been careful to make the turret assembly hollow so that you can still screw the locomotive's shell to the electric motor assembly which fits underneath (classic Lionel design). 3. Getting the Dakka Chugga to Canada and Back! We transported it in three pieces. (1) Electric motor for the Chugga. This we fully bubble wrapped - and placed in its own area. It is pretty massy - iron outer section; copper windings; iron wheels. So, we figured we should keep it away from other plastic models. Also didn't want it installed in the Chugga because we didn't want it's mass to cause the outer shell to slam into things. (2) Chugga shell. Wrapped this carefully in bubble wrap and soft material. (3) Fully assembled Tenda. Wrapped this carefully in bubble wrap and soft material. Tenda - no issues either way. 100% success. Chugga - only minor issues. Electric motor pretty much impervious - and as far as we could tell we didn't suffer any fratricide either (because of the mass of the motor). We had the starboard side gun-arm come off on the trip into Canada (very easy fix); and zero issues on the trip home. 4. 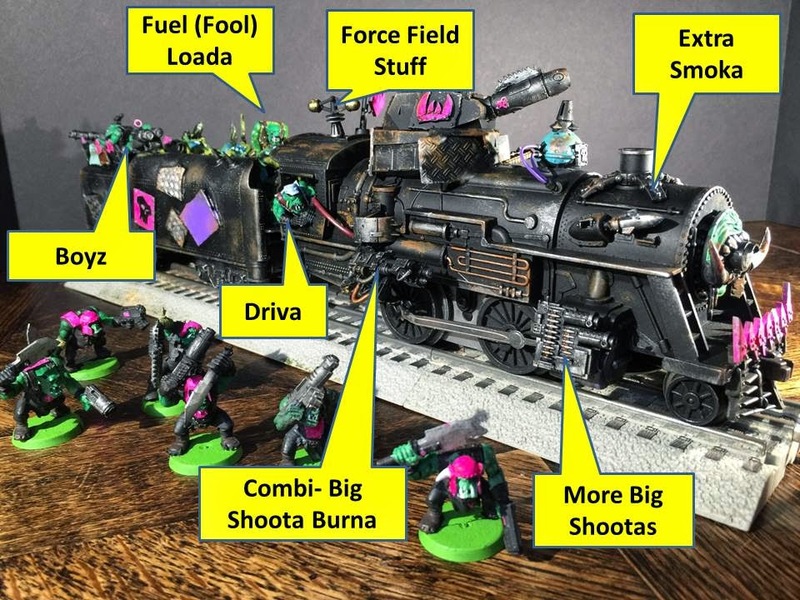 Improvements to the Dakka Chugga! More Dakka Twin linked big shoot out the port-side window. We have this ready to go - just didn't have it painted in time. This way the Driva has something to easily aim and shoot. This is also the reason we set him up with the periscope. Next writing -- will finish the Pink Orkys story - Chaptas 2 and 3. Fighting off Tyranids; Riding the Dakka Chugga. Next build project -- working on a Gantry for our Launchable Grot Rokkit [Link to that posting]. And, starting to scheme on a modified diesel locomotive for the Yellow Orks to use. Planning to modify a GP9 for that! We set up some track and put the Dakka Chugga to work (hauling Space Marines)!